In 2015 my fiancé and I had agreed to requalify for the Hilton’s loyalty program Hilton Honors gold status, so in January 2016 we pre-booked stays accordingly to achieve our goal. 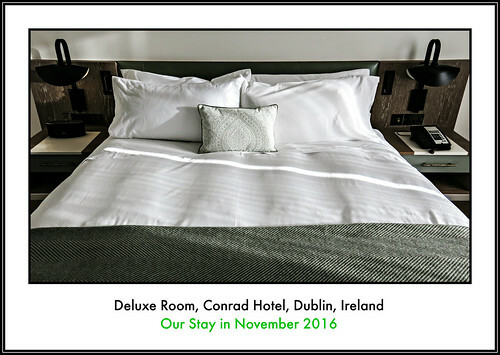 We had stayed at the Conrad Dublin before, so this was our second and third stay in November and December 2016 for one night each, which I have combined. The Conrad had gone through a major renovation and the restaurant and bar received a make-over too. It was unrecognizable at first. The hotel had finally arrived at the 21st Century. The interiors are inspired by nearby Iveagh Gardens, so there were flower arrangements and prints. The chandeliers were inspired by branches of trees. The Coburg Brasserie, an equestrian themed restaurant which felt modern and inviting and Lemuel’s Bar was inspired by Gulliver’s Travels. We liked both designs and felt well visiting both. The reception had moved closer to the entrance. There were maps of historical Dublin behind it. We liked the details, like mirrors with flower frames, the seating areas including a pink sofa, the marble and Art Deco elements. A ball room was also located on the ground floor. The business center and meeting rooms, named after rivers in Dublin were on the first floor. The fitness center with TechnoGym equipment and the pub Alfie Byrne were on the lower ground floor. Check in was done very efficient and the welcome was warm. We booked a Deluxe Room and received one on the 6th floor. When checking at the online application the Deluxe Room chosen for us had already the view (over the National Concert Hall, Earlsfort Terrace and the city) we wanted, so we kept it. The room was large and the color scheme black, white, green, brown and anthracite. There was a small hallway with a wardrobe. The floor and one wall are wooden, which gave the room a residential feel. It reminded us of our stay at the Sherwood in Taipei. A sofa was facing the comfortable king sized bed and was located underneath the TV. Obviously watching TV from the sofa wasn’t possible. We enjoyed sitting there for a chat and to have a light meal before our dinner at the Coburg Brasserie. There was also a carpet. The bedside lamps were unusual and reminded us about the Burren. The modern artwork above the bed had us discussing what it was depicting. We came to the conclusion it could be inspired by the stairs of Earlsfort Terrace or it was a river, muscles or an arm. The handles of our drawers looked like tree trunks or branches. The writing desk was lacquered with integrated outlets, which were easy accessible, and had an elaborate base. There was a golden designer lamp as well. The desk was facing the room and located in the bay window. Watching TV from the writing desk was possible. There were around 40 channels with lots of regional and international ones like Bloomberg, CNN and CNBC. The WIFI worked well at all times in the hotel as far as we remember. Magazines available were Conrad’s own, the 30th edition Dining in Dublin and Travel Ireland. There was also a jogging map and suggestions by the concierge what you can do, when you have 1, 3 or 5 hours in Dublin. The mini fridge contained two bottles of complimentary Conrad branded water. We used the 24 hour in room dining, which was promptly delivered and correct. The friendly member of staff and I chatted about my Doctor Marten’s boots. He liked them. Our order included two Connemara cured salmon and one fresh fruit salad with a dollop of fresh cream. When requesting the meal we were offered tap water too. It was a thoughtful touch, but we had our own drinks, so it was okay. The presentation was beautiful and the quality of the food very high. The cost was 38 Euro / ca. 44.30 USD. There was also an iron and ironing board. The bathroom was large with a sink, bath tub-shower combination and a toilet. My fiancé surprised me by having requested Shanghai Tang bathroom amenities instead of the usual Aroma Therapy Associates via the online concierge. We have clothing from Shanghai Tang and know some of their perfumes, so we knew we would like it. The water pressure of the shower was good and there were no complaints about temperature changes. When checking in in December 2016 we had to wait for a bit due to a small queue. We had booked a Premier Room to find out what the difference was to the Deluxe Room beside the inclusion of two drink vouchers per person according to the website. At check in we received only one each, so I asked about it and received another set. Late checkout at 2 PM was granted without problems. The room layout and look were identical. Here are some of the differences we noticed. The refreshment center could be stocked at request with choices of snacks including Keogh’s crisps (2.50 Euro / ca. 2.95 USD), Dormen’s Jelly Beans, wasabi peanuts and chili and lime cashews (5.45 Euro each / ca. 6.40 USD) or Benoit’s Chocolate Factory at 5.95 Euro / ca. 6.95 USD. The views from the 7th floor were better than the ones from the 6th. While the differences in height sound small on paper in reality the difference was noteworthy as we found out. The artwork was different too. The room felt more luxurious due to the loofa, shoe polish equipment and more pillows. We had also requested arrival amenities. The strawberries dipped in Valrhona chocolate and a bottle of Acqua Panna were already waiting for us. The strawberries were yummy as expected. During this stay we had in room dining too. It included a beef burger with Dubliner Vintage Cheddar Cheese, home-made relish and twice cooked chips and a Croque Monsieur with Glen of Arklow baked ham, creamy béchamel sauce and Emmental Cheese on toasted sourdough bread and a fruit salad. The bill was 44 Euro / ca. 51.10 USD. We used our drinks vouchers at Lemuel’s Bar. It was incredible busy, so we decided to make sure we would get a table by calling from our room to reserve one for later in the day. In a separate review I will write about breakfast and dinner at Coburg Brasserie. We would return again, if we are looking for a luxurious stay in the heart of Dublin. The Conrad beside the Morrison, A DoubleTree by Hilton Hotel so far remain in our books the most memorable, stylish and luxurious Hilton options in Dublin, Ireland. Would we recommend this hotel to a friend? YES! Would we want to stay with them again in our future? YES!